CHATTANOOGA, Tenn. (AP) — Chattanooga firefighters were responding to a medical emergency on state Route 153 when a fire came to them. According to a news release, the firefighters were on a bridge over the Chickamauga Dam on Friday helping put a man in an ambulance when a flaming truck pulled up next to them hauling a trailer loaded with wood. The firefighters quickly suited up and put out the fire, which they contained to the engine compartment and cab. The ambulance was not damaged, and no one was injured. Hamilton County EMS transported the man with the medical emergency to a local hospital. 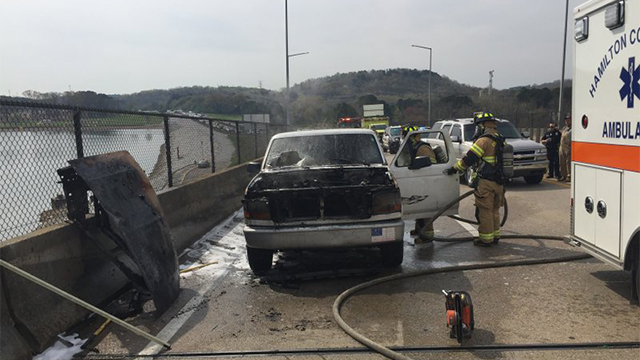 A Tennessee Department of Transportation truck pulled the burned-up truck and trailer off the dam, clearing the way for traffic, which had backed up considerably.